A simple Healthy Vietnamese Pho Soup cannot only take you through a cold winter but right into spring with it’s fresh ingredients. 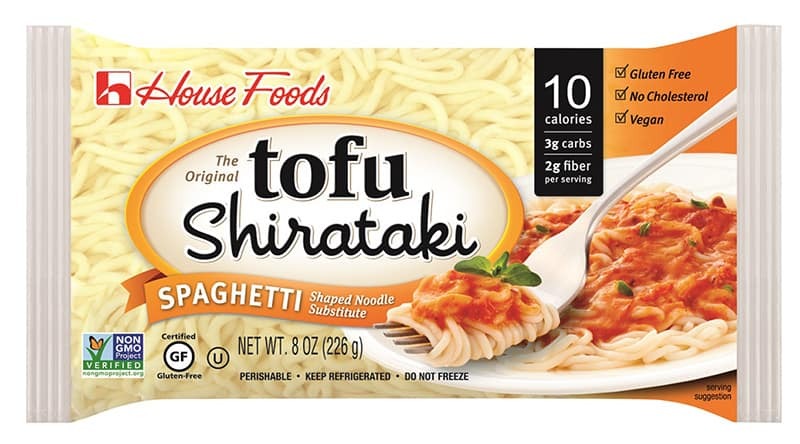 It is a simple quick fix that my whole family loves especially when made with easy House Foods Shirataki Noodles. It can be made with chicken and fish sauce or those can be omitted and it is vegetarian or vegan, just check your individual products to make sure. This can be gluten free also if you make sure the hoisin sauce is also gluten free or omit it. The Shirataki noodles that are used in this recipe are vegan and gluten free and are so easy to use. Just a quick rinse and a fast 2 min. boil and they will be waiting for you while you make the rest of the soup. 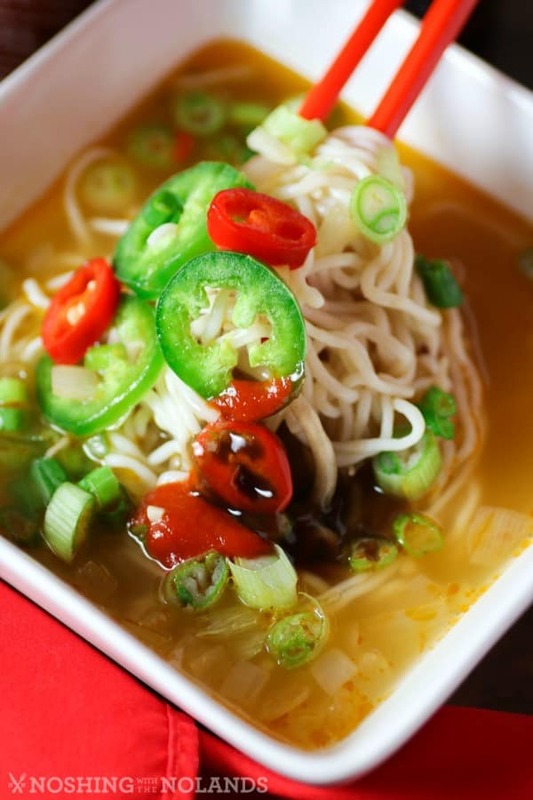 They are perfect in an Asian soup like this and one that we love making as it whips up in 20 min. max. This soup is very versatile, not only can it be made with chicken or remain vegan, it can be dressed up to how you like it. Bring on the spicy heat of fresh jalapenos and little red peppers. 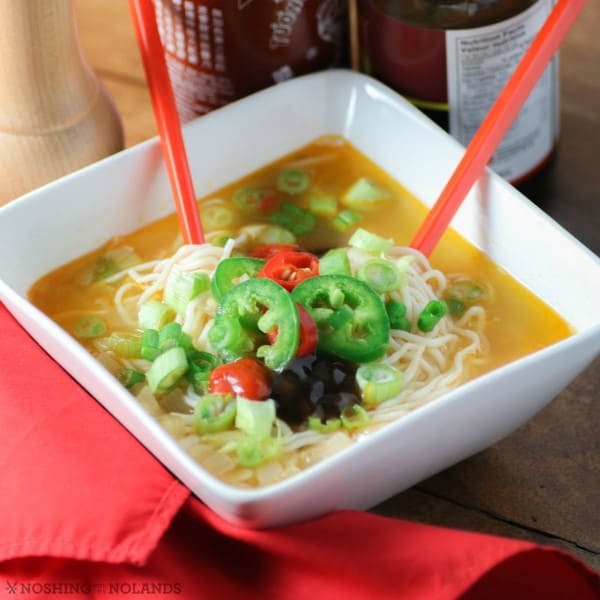 Amp it up even more with Sriracha or omit those and you still have a very flavorful soup! Each member of your family can have it how they like it right down to the toddlers. For this recipe I used House Foods Shirataki Spaghetti, they are only 10 calories per serving which is nothing compared to pasta! You can use these noodles in any recipe that requires pasta, I find they are gorgeous in an Asian soup like we have today. Wouldn’t use anything else!! They are also low in carbs, non GMO and give you 2 gms. of fiber too! Here is a little graph explaining all about House Foods Products. They are so healthy you are going to want to add them into your weekly meals. Kids love noodles and you can be happy to know that they are having a nutritious alternative to pasta. All of the ingredients for this recipe are easily accessible. 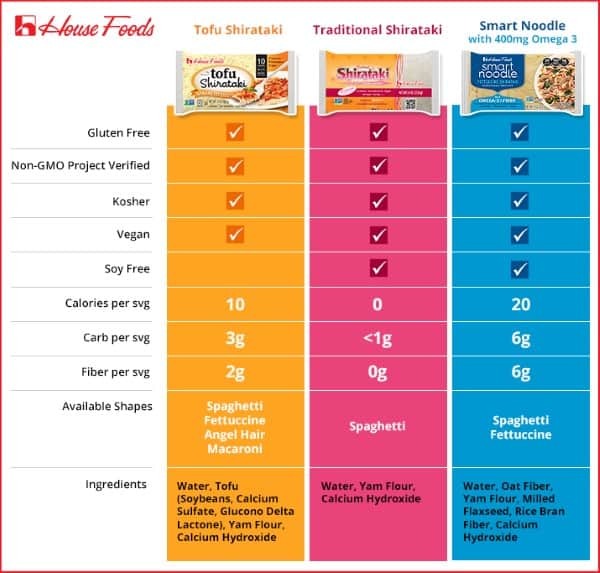 Shirataki noodles can be found in your local grocery store in Canada and the US. Healthy Vietnamese Pho Soup is simple and easy to make and can be customized to your liking being, vegan, gluten free, spicy etc. Rinse and cook Shirataki noodles according to package and set aside. In a large pot add the canola oil and saute the onion, ginger and garlic for 3 min. Season with salt and pepper. Add the chicken or vegetable stock and let simmer for 15 min. Add in the fish sauce and sesame oil along with the noodles and chicken if using and heat through. To each bowl add a small handful of bean sprouts. 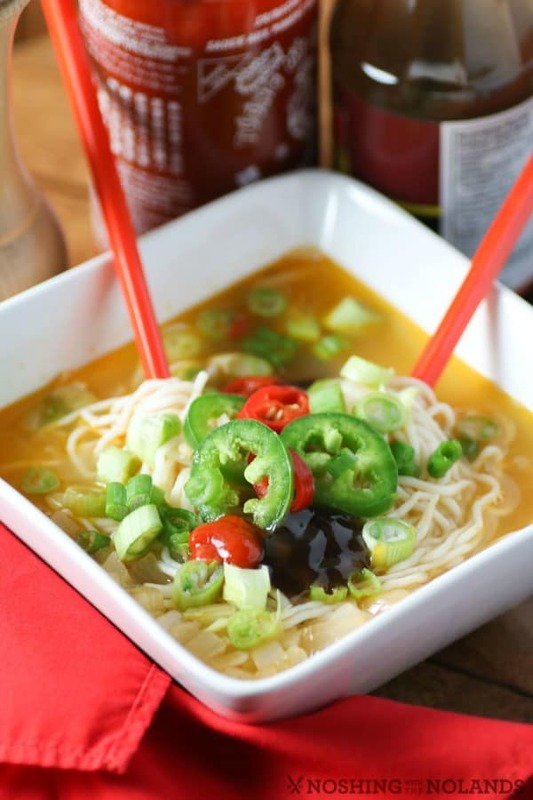 Ladle the soup over and top with the green onions, jalapenos, Hoisin and Sriracha sauce. Serve immediately. I tried to make Pho’ so many times, but the noodles I get just aren’t right! Maybe I should have asked you, first! I love Pho, but have never made it myself. I will have to make it with these noodles. That looks as good as it sounds! I love the colors, and I love the flavors! I have never tried any Vietnamese food before. This sounds like a great place to start. I do love soups, no matter what nationality they came from. I have never tried Pho soup before but I am inspired to do so now. Wow, does it look so vibrant! I’ve never tried a soup like this but am willing to give it a whirl. Thanks for the recipe and dinner idea! This soup looks so delicious and easy to make. I will have to get the ingredients I need to make some this week. 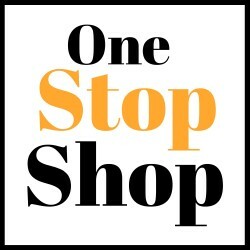 I will have to look for House Foods Products when I go shopping this week. I am excited to try this recipe. Mm, this looks similar to the udon we ate in Japan. I’ll have to try it for sure! I’ve never had this before but it looks great! Thanks for sharing the recipe so I can make it at home. I love trying different foods and this looks absolutely delicious!! I can’t wait to try it, seriously looks like the flavors jump out of the picture, I’m so hungry right now!! This looks like such a colorful and tasty soup! I’ve never tried Pho before but this seems like an easy recipe to try out. I would love this for dinner tonight! It looks SO comforting! I’ve never tried PHO and now I am beyond excited to try it- especially since now I have your delicious recipe! I can’t wait to create this in my kitchen- thanks for sharing your foodie goodness! This looks so yummy! I love pho soup! It looks delicious and healthy! Thank you for the recipe. Looks great! I love to make Pho, but have never used these noodles. Now I’m on a mission to find them!